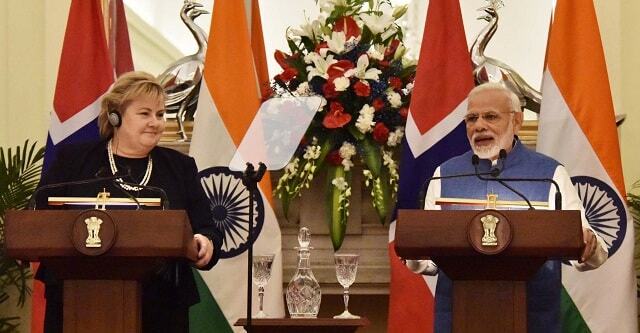 The launch of the initiative came after the Indian and Norwegian governments signed an MoU to establish the ‘India-Norway Ocean Dialogue’ during the Norwegian Prime Minister Erna Solberg’s visit to India in January 2019. The Joint Initiative was signed by Nils Ragnar Kamsvag, Norwegian Ambassador to India and Anil Kumar Jain, Additional Secretary in the Union Ministry of Environment, Forest and Climate Change. A Joint Task Force on Blue Economy was also established under the aegis of the MoU to promote multi-sectoral cooperation in various aspects of Blue Economy. The task force comprises of government officials, researchers and experts. It was tasked to develop sustainable solutions within strategic areas of the blue economy, such as maritime and marine sector in addition to energy sector. Note: Blue Economy can be defined as ‘sustainable use of ocean resources for economic growth, improved livelihoods and better ocean ecosystem health’. The Blue Economy comprises various activities such as fisheries, marine transport, waste management, tourism, climate change, etc. • The India-Norway Marine Pollution Initiative will combat marine pollution, which is one of the fastest growing environmental concerns. • Norway and India will share experiences, competence and collaborate on efforts to develop clean and healthy oceans. • Both the sides will jointly collaborate for sustainable use of ocean resources and growth in the blue economy. • Through a range of implementing partners, this initiative will seek to support local governments in implementing sustainable waste management practices, develop systems for collecting and analysing information about sources and scope of marine pollution. • They will also work towards beach clean-up efforts, awareness raising campaigns and pilot project using plastic waste as fuel substitution for coal in cement production.